On Saturday, June 16, 2018, the National Park Service will host a collaborative program called “Discover Native Warm-Season Forages” from 9 a.m. to 12:00 p.m. at Hopewell Culture National Historical Park (Mound City Group Visitor Center:16062 State Route 104 Chillicothe, OH 4560). 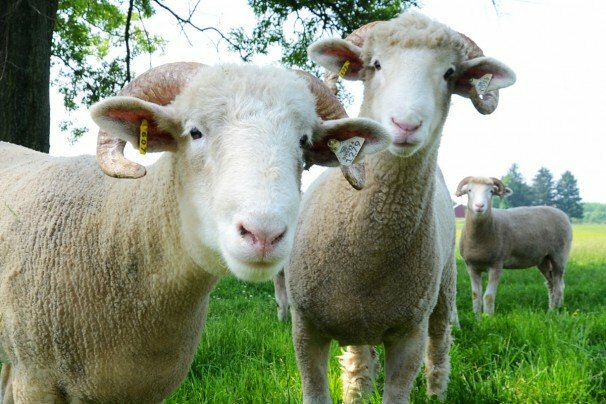 This free event is a combined effort of the National Park Service, The Ohio State University, Ohio Division of Wildlife, Ohio Forage and Grasslands Council, Pheasants Forever, Inc. and Quail Forever to share information about the versatility of native warm-season forages for conservation, wildlife, and livestock production. From 1 p.m. to 2 p.m. an optional tour of the Hopeton Earthworks site will be offered as well. Attendance RSVPs are requested for submission by Friday, June 8. Noble County Extension is the contact point for registration information. Call 740-732-5681 for more details. You do not have to look long and hard to find plenty of evidence that feeder calf marketing is undergoing significant changes across the country. 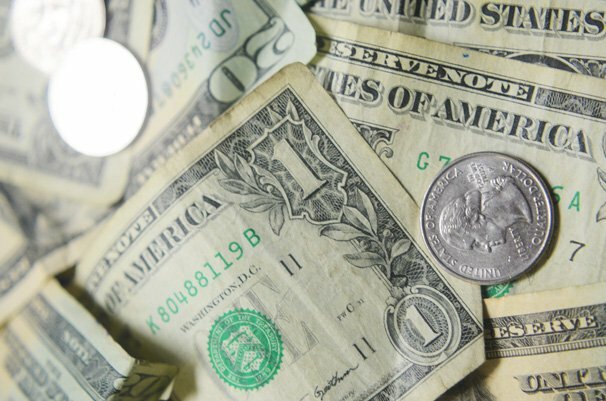 The market is currently sending a clear message that buyers are demanding more for their purchasing dollars. Significant discounts are occurring in the market place for feeder calves that are not weaned 45-60 days, castrated & healed, dehorned, and given 2 rounds of a modified live vaccine for the shipping fever complex. In 2019, a major restaurant chain is going to start requiring their suppliers of fed cattle to be Beef Quality Assurance certified. This will in turn be pushed down to the producer level. Exports to China and other countries are going to require age and source verification. These are growing realities for cow-calf producers if they want access to as many markets as possible. In the eleventh chapter of Deuteronomy Moses wrote a phrase that is still being implemented on the land today by a family who holds those words in high esteem. These verses serve as a cornerstone for the Dorrance family in Ross County on their Pastured Providence Farmstead. 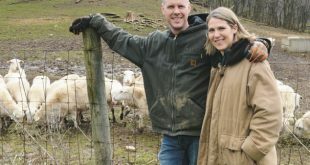 Paul Dorrance along with his wife Heather and three children are fairly new to agriculture, but through the intertwining of faith and desire to be good stewards of the land they are providing high quality products to Chillicothe and the surrounding community. Overwhelming opposition from a strong coalition of dairy farmers, processors, consumer groups, food safety advocates, federal and state public health regulators, the medical community, and other key stakeholders led to the defeat of an amendment to the 2018 House Farm Bill that would have allowed the interstate sale of unpasteurized milk. Amendment 30, offered by Rep. Thomas Massie (R-KY), would have removed existing regulations that prohibit the interstate sale of raw milk for direct human consumption — a development that the coalition of opponents said would have threatened the health of millions of Americans. The Massie amendment failed in the House by a vote of 331 against to 79 in favor. In a May 14 letter to House leaders Paul Ryan (R-WI) and Nancy Pelosi (D-CA), the National Milk Producers Federation (NMPF) and the International Dairy Foods Association (IDFA) insisted that Massie’s proposed amendment to the Agriculture and Nutrition Act of 2018 (H.R. 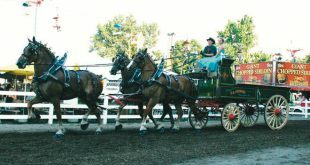 All evening performances during the 2018 Ohio State Fair Draft Horse Show will be streamed live on the Ohio’s Country Journal/Ohio Ag Net Facebook page as well as at ocj.com. The list of classes that will be streamed live is listed below. Click here to download a complete schedule of all classes including those that will not be streamed live. Monday, July 30, 2018 at 5:30 p.m.
Tuesday, July 31, 2018 at 5:30 p.m.
Wednesday, August 1, 2018 at 5:30 p.m. The Ohio Pork Council received top honors at this year’s American Association of Political Consultants Pollie Award conference for their pig barn pop-up mail piece. The goal of this piece was to create an eye-catching visual education piece that would capture the audience’s attention. Once their attention was captured, this piece worked to relieve misconceptions about the pork industry by answering questions and increasing transparency of modern farming. The barn discussed several topics, such as technology, manure and pig feed. This piece was created in a format that could be hand delivered to neighbors or utilized in meetings with major policy decision makers. Dubbed “the Oscars of political advertising” by Esquire magazine, the Pollies are the most prized and sought-after awards in the political communications and public affairs industries. 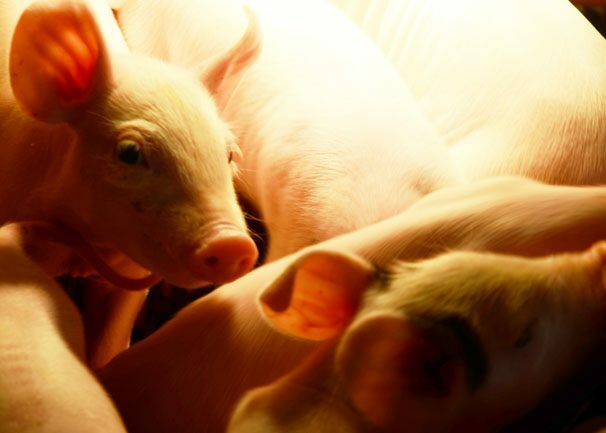 In late April a federal jury, after less than two days of deliberation, found in favor of 10 neighbors of an eastern North Carolina hog farm, awarding them $750,000 in compensatory damages and $50 million in punitive damages over complaints of odor and noise from the farm. 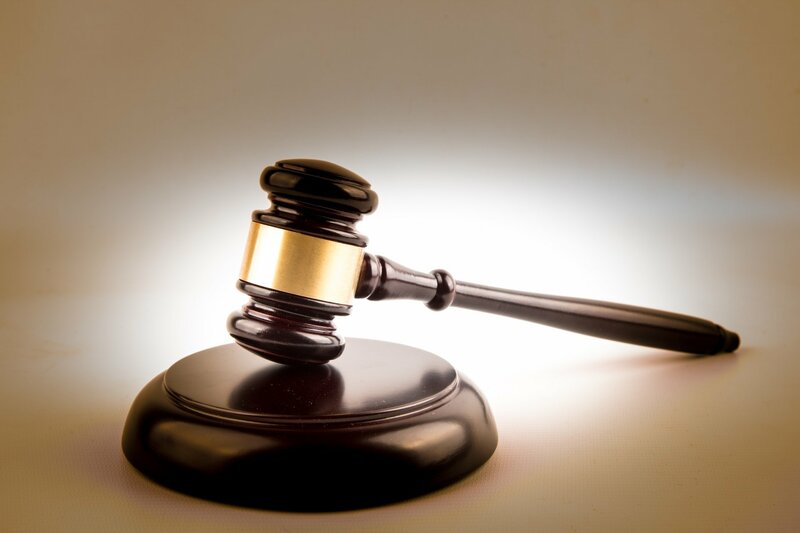 The jury unanimously agreed that Murphy-Brown, which owns the hogs at Kinlaw Farms in Bladen County, “substantially and unreasonably interfered with the plaintiff’s use and enjoyment of their property.” Murphy-Brown, the hog production subsidiary of Smithfield Foods, will appeal the court verdict against one of its contract pork producers to the U.S. Court of Appeals for the 4th Circuit, which is based in Richmond, Va. The National Pork Producers Council closely monitored the case and called the nuisance lawsuit “frivolous” and an “unwarranted attack on livestock agriculture.” NPPC pointed out that Smithfield operated in compliance with federal and state laws, including applicable occupational health and safety rules. The April Dairy Market Report is now available. The U.S. average all-milk price lost a total of $2.80 per cwt. 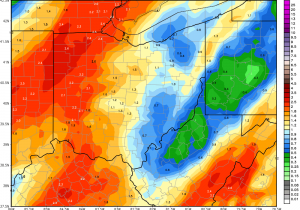 in three roughly equal drops from November 2017 through this past February. Total U.S. milk production was up by 1.6% from a year earlier during the three months of December 2017 through February 2018, while estimated total U.S. production of milk solids rose by 2% during the same period. The monthly margin under the dairy Margin Protection Program (MPP) for February 2018 was $6.88 per cwt. It was the third month in a row during which the MPP margin was down more than $1.00 per cwt. from the previous month. Find the Dairy Market Report here. 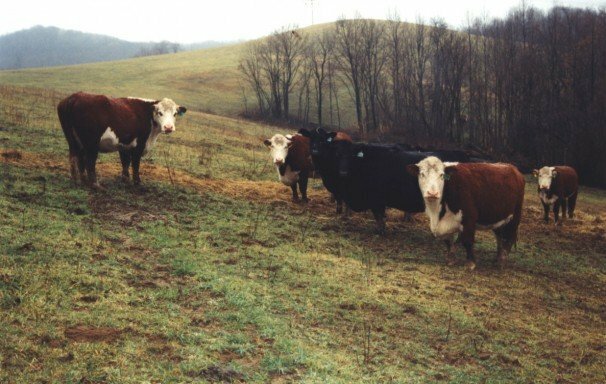 A: Beef Quality Assurance is a nationally coordinated, state implemented program that provides systematic information to U.S. beef producers and beef consumers of how common sense husbandry techniques can be coupled with accepted scientific knowledge to raise cattle under optimum management and environmental conditions. Q: I’ve never been BQA Certified, why do it now? A: By 2019 Wendy’s has committed to sourcing beef from only BQA Certified producers and Tyson has pledged to follow suit, also by January 1, 2019. We expect other retailers and packers will do the same. Being BQA Certified will be a producer’s ticket to market access, much like the pork industry. Q: Who needs to be BQA Certified? A: Anyone selling beef animals to be harvested for meat. This includes producers of fed beef, dairy beef, cull cows and bulls including dairy cull cows. Q: What do I need to do to become BQA Certified? 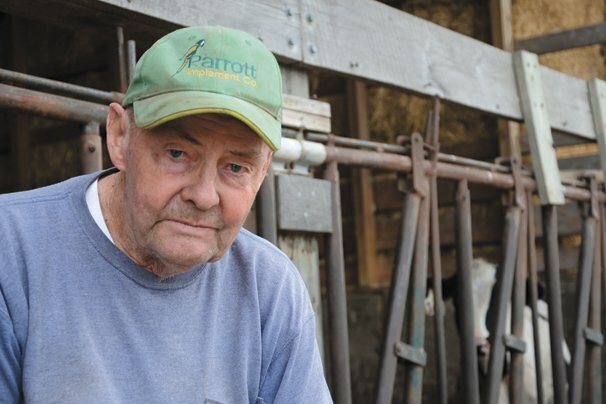 Every year, some farmers retire and give up their dairy licenses, but there’s been an uptick recently. 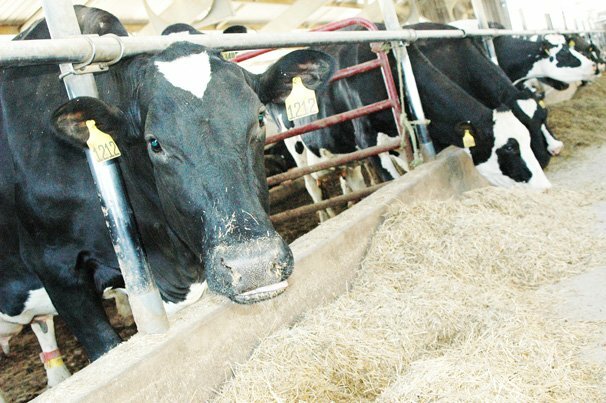 In March 2018, there were 2,253 licensed dairy farms in Ohio — a drop of 59 farms in five months. 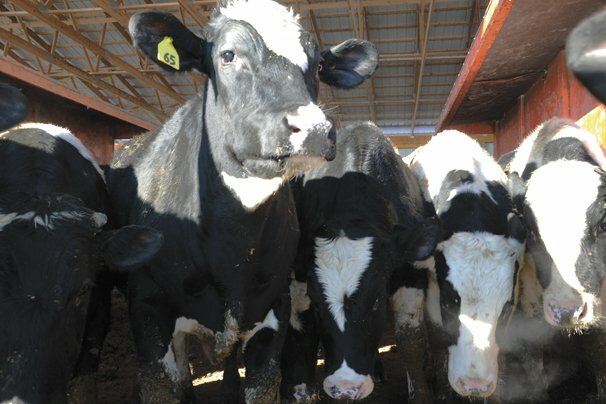 “Farmers are deciding they can no longer dig any deeper into their equity to pay for what I call ‘the privilege of milking cows,’ ” said Dianne Shoemaker, Ohio State University Extension field specialist in dairy production economics. Inside cool water-filled tanks in southern Ohio, the laws of nature are being defied. Female yellow perch mate with other female yellow perch; male bluegills with other male bluegills. This might make one wonder, unless, of course, your profession is selective breeding of fish, and your goal is to get them to grow faster. Hanping Wang, who manages The Ohio State University’s Ohio Center for Aquaculture Research and Development, has succeeded in raising faster-growing fish by artificially mating them in a not so typical way. On average, the resulting offspring reach market size six months faster than bluegills or yellow perch bred out of standard male-female mating. That’s because among yellow perch, females grow quicker than males. Among bluegills, males grow faster than females. For an Ohio fish farmer, having fish that mature faster than average could be a significant savings in fish food and in time waiting to sell them, said Wang, whose center in Piketon is part of Ohio State’s College of Food, Agricultural, and Environmental Sciences (CFAES). On Saturday, May 19, 2018, the Ohio Pork Council will be hosting the Pork-a-Palooza, featuring: bacon, BBQ and beer at the Delaware County Fairgrounds. The event will be held from 1 p.m. – 7 p.m., and will feature pork products and sides from local food trucks and restaurants. Pork producers and consumers are invited to enjoy a fun-filled afternoon with music, food, beverages, children’s inflatables and educational opportunities. Tickets are $10 per person and children 12 and under are free. Tickets can be purchased online at pork-a-palooza.com or on the day of the event. Ohio pork farmers, through the Ohio Pork Council’s (OPC) Pork Power program, have partnered with generous supporters, including the Ohio Corn & Wheat, to provide the Toledo Northwestern Ohio Food Bank and Central College Presbyterian Church Food Pantry with a combined 20,300 pounds of lean ground pork. The protein-packed donation will provide roughly 100,00 meals to those in need. Since the program’s inception, more than 1.6 million fresh, wholesome meals have been donated to local foodbanks in Ohio. “Ohio Corn & Wheat is pleased to join with the Ohio Pork Council to demonstrate that Ohio farmers are committed to feeding the world, including Ohioans who need may need assistance,” said Tadd Nicholson, Executive Director of Ohio Corn & Wheat. The United States and Argentina last week finalized an export certificate that allows the U.S. pork industry to ship product to the South American country. The Office of the U.S. Trade Representative (USTR) accepted a petition from the National Milk Producers Federation (NMPF) and the U.S. Dairy Export Council (USDEC) to examine India’s failure to follow through on its obligations to provide “equitable and reasonable access to its market” for dairy products. In addition, Indonesia, which has also been pursuing dairy trade distorting policies, will be included in USTR’s review to assess that country’s compliance with its market access obligations. It’s better to feed more hay than graze too soon! Nobody is short of moisture. I look forward to just having firm footing again. When you can’t walk across the yard without splashing water up on you, it’s wet. The livestock are also getting tired of the wet conditions and continuous showers. I’ve had several calls from people looking for hay. This is a really bad time to be running out. The latest call was someone who had just fed their last bales and did not want to turn out on pasture yet until they had enough forage growth. That is exactly what I like to hear. If you turn out too early, the grass never gets much of a chance to get good leaf cover. Grazing too early in the spring does nothing but remove that solar panel the plants need to start building sugar and growing new roots. The forages really need to be able to canopy and get a good start before animals begin removing the top growth otherwise production will be reduced. 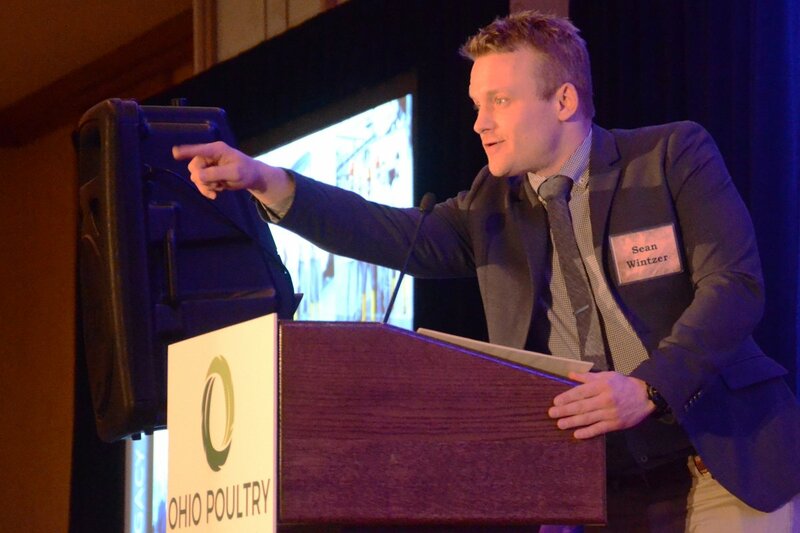 As always the Ohio Poultry Association Annual Celebration Banquet was an event not to be missed. The 33rd annual banquet featured great food and the chance to recognize award winners. Award went to Kevin Elder. 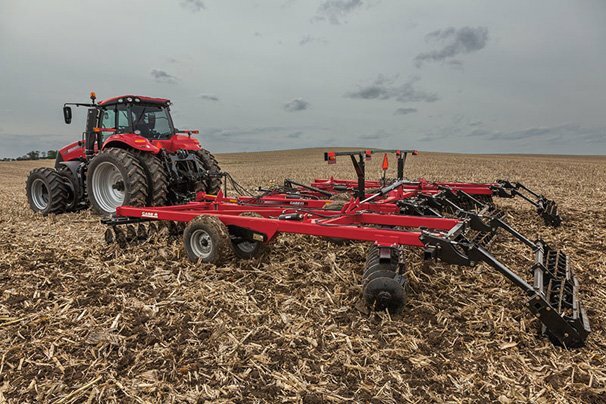 As a technician for the Fairfield Soil and Water Conservation District in the late 1970s and early 1980s, Elder helped introduce farmers to no-till practices. He then served as the Ohio Department of Natural Resources Division of Soil and Water Conservation, Engineering Section administrator and as an agricultural pollution abatement specialist and was instrumental in rewriting Ohio’s agricultural pollution abatement law and developing the state’s manure management program. In addition, he worked with local soil and water conservation districts and USDA agencies to design and inspect the construction of natural resource conservation practices. Pork exports totaled 205,466 metric tons (mt) in February, up 4% from last year’s large total, while export value increased 12% to $547.2 million. Through February, pork exports were 2% ahead of last year’s pace at 408,934 mt, while export value climbed 10% to $1.09 billion. February exports accounted for 27.8% of total pork production and 24% for muscle cuts only — up from 27.6% and 22.9%, respectively, a year ago. Through February, the percentage of total pork production exported was slightly lower year-over-year at 26.1%, while the percentage of muscle cuts exported edged higher to 22.7%. February export value averaged $56.78 per head slaughtered, up 9% from a year ago. Through February, per-head export value was $53.70, up 5%. From the beef sector side, this could have an implication on beef markets if all of these dairy operations are forced to sell out. One would imagine these dairy operations would be able to market heifers and some of the young fresh cows. However, there would likely also be a short-term glut of slaughter cows in the region. From another standpoint, some of these dairies might consider beef cattle production as an alternative. The resources these dairies have could lend itself to backgrounding feeder cattle or a confined beef cattle operation. 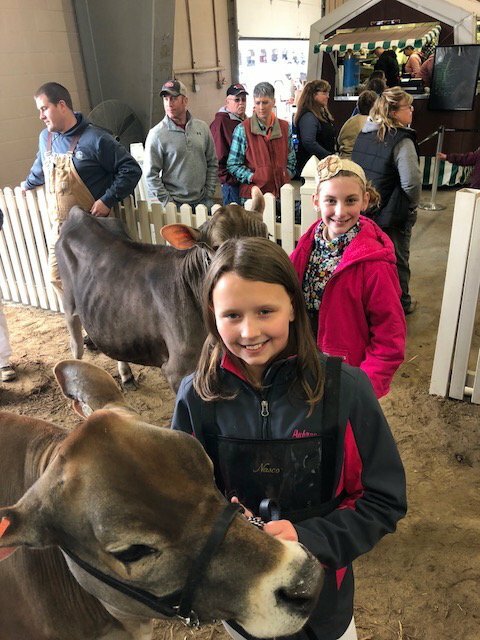 Though dairy prices continue to be serious concern, it did not slow down participants and exhibitors at the 2018 Spring Dairy Expo at the soggy/chilly/sunny/cloudy end of March. The Stark County Senior Team won the Ohio 4-H Dairy Judging Contest at the event.